As noted in a previous post, much of the current conflict between Jewish- and Palestinian–Israelis, in fact, much of the conflict between Jewish-Israelis and the world, focuses on the establishment and expansion of the Settlements in the West Bank. At at the bottom of this post is a longer summary of the Settlements issue, taken from an NPR piece on the topic, I’m including it at the end for anyone who’d like a more in-depth, but still succinct, explanation of the issue. For our encounter with Settlements and Settlers, we traveled some 40 miles north of Jerusalem Halamish (If you were plunked down in the middle of the street below, you might think you were in Clovis). On 16 October 1977, two groups of settlers, one religious and one secular, with a total of 40 families moved into the abandoned former British fort near the Palestinian village. Today, the Settlement has grown to approximately 1,200 members. For more on the founding of Hamalish, see here. Three bright and articulate women were our hosts for the day: Our guide (below left) was Judy Aurebach; Sandra Barrett (below center), a community leader, gave us a history of the biblical and modern claims for the establishment of the Settlement; and Shu (below right), another community leader, gave us a current description of the state of things in the Settlements. The Settlements cannot be understood from their religious and political foundations. In brief, the claim for the right to establish this particular settlement can be found on the books of the Genesis, where God gave this land to Israel, and in the book of Deuteronomy, where God promises a return to Israel after a time of scattering (the Diaspora) due to Israel’s disobedience. Without question, in the minds of these community leaders, and no doubt a majority of the Settlers, the return of the Jews to the land of Israel in early- to mid-portion of the 20th century (after 2000 years of being scattered across the earth), combined with the formation of Israel as a Jewish Democratic state in 1948, is nothing short of a miracle and validation of God’s promise. Claim for the land depends on “when you draw the line.” Palestinians, according to the Settlers, conveniently draw the line much too recently – it is the Jews who have the longest standing claim for the land, having been their longest standing, traceable descendants. The Settlers didn’t settle on any land for which there was a legitimate Palestinian claim, having chosen land previously owned and managed by the Ottoman empire and lost at the end of WWI. The Jews have “made something”out of the land and have a kind of industriousness that is not a prominent among the Palestinians. Jews respond to “provocation” in the Judea/Samaria (West Bank, or Occupied Territories, to Palestinians) by expanding Settlements. All this has led to a confidence in the Settlers self-understanding of their right to settle this site. Settlements are almost universally condemned, and a recent UN Resolution 2334 passed 14-0, with the United States abstaining (source). U. S. Presidents going back to Clinton have advised to strongly advised against Settlement expansion as an impediment to peace. This was the strongest presentation to date on the religious rationale for not only the Settlements, but also for a Jewish nation of Israel. Religious claims, on either side, make negotiations more difficult. We wondered if some of the comments stereotyping Palestinians work ethic were racist and gave a false sense of racial superiority. The United States has opposed Settlements for several decades now as does the international community. Many of the assertions made by our host were at odds with what we have heard others make. Palestinians are advantaged by Israeli rule in the land. In sum, this excursion helps with another piece of a most complex puzzle. We, as a group, are beginning to both better see that complexity as well as understand the strengths/weaknesses of the various peace proposals. Tomorrow, off to meet with a negotiator from the Palestinian Liberation Organization (PLO). The term “settlements” may conjure up images of small encampments or temporary housing, and many have started that way. But they now include large subdivisions, even sizable cities, with manicured lawns and streets full of middle-class villas often set on arid hilltops. Israel is constantly building new homes and offers financial incentives for Israelis to live in the West Bank. When the Israelis and Palestinians first began peace talks after a 1993 interim agreement, the West Bank settlers numbered a little over 100,000. Today they total around 400,000 and live in about 130 separate settlements (this doesn’t include East Jerusalem, which we’ll address in a moment). Critics of settlements say they’ve intentionally been established in every corner of the West Bank, giving the Israeli military a reason to be present throughout the territory and making it impossible to create a viable Palestinian state. The settlement locations and the roads that connect them make Palestinian movement difficult. Shortly after the 1967 war, Israel annexed East Jerusalem, which is part of the West Bank and had a population that was then entirely Palestinian. 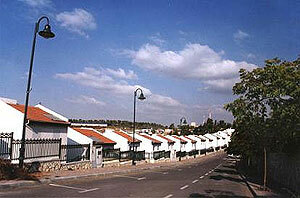 Israel declared the entire city to be Israel’s “eternal and indivisible” capital. No other country recognizes Israel’s annexation of East Jerusalem, with the United States and others saying the city’s status must be determined in negotiations. This is why the U.S. and other countries have never moved their embassies to Jerusalem. Most are in Tel Aviv. Around 200,000 Israelis now live in East Jerusalem. Combined with the roughly 400,000 settlers in the West Bank, about 600,000 Israelis now live beyond the country’s 1967 borders. That’s nearly 10 percent of Israel’s 6.3 million Jewish citizens. The settlers and their supporters cite the Jewish Bible, thousands of years of Jewish history, and Israel’s need for “strategic depth” as reasons for living in the West Bank. The settlers want to be formally incorporated into Israel, but that would ignite a major controversy. For now, Israel regards the West Bank as “disputed” territory that has been under the Israeli military since the 1967 war. The evacuation of the settlements was deeply divisive within Israel, and Israel’s security forces had to drag some settlers from their homes kicking and screaming. The episode demonstrated that Israel could remove settlers, but it also showed how much friction it creates inside Israel.